NEW. 9781138129689 This listing is a new book, a title currently in-print which we order directly and immediately from the publisher. For all enquiries, please contact Herb Tandree Philosophy Books directly-customer service is our primary goal. NEW. 9781138875258 This listing is a new book, a title currently in-print which we order directly and immediately from the publisher. For all enquiries, please contact Herb Tandree Philosophy Books directly-customer service is our primary goal. Good. 1138875252 Meets the good condition guidelines. Has some writing/highlighting. Tearing on cover repaired with book tape. Has wear. Five star seller-Buy with confidence! New. Trade paperback (US). Glued binding. 268 p. Contains: Illustrations, black & white. The book is theoretical attempt to clarify the problem of ethics and psychology; its aim is to make the reader question himself rather than to pacify him. The book does not contain a recipe for integrated and autonomous person to achieve a life of a joy and happiness. 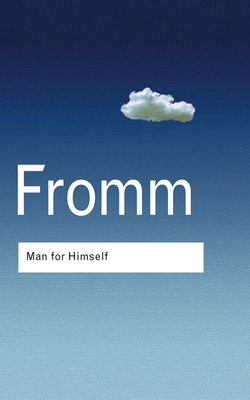 Dr. Fromm studies the myths and overstatements of different human qualities: self-love and selfishness, satisfaction and happiness. He explains why some of Freud's concepts are deficient to understand all forms of productive love: care, responsibility, respect and knowledge. Dr. Fromm tries to explain human personality, character and temperament not because he is interesting about human nature, but because he tries to understand and explain what qualities human can develop to perform man's main task in life ? to give birth to himself. The moral problem is man's indifference to himself. Man is the only being who is capable of understanding the very forces which he is subjected to and who by his understanding can take an active part in his own fate and strengthen those elements which strive for the good. Man is the only creature endowed with conscience. Dr. Fromm explores two types of conscience: authoritarian (?voice? of an internalized external authority) and humanistic (?voice? which calls human back to himself). He explains that everybody has both ?consciences?. The problem is to distinguish their respective and their interrelation. He says that humanistic ethics takes the position that if man is alive he knows what is allowed; and to be alive means to be productive, to use one's powers not for any purpose transcending man, but for oneself, to make sense of one's existence, to be human.